Ayers Basement Systems offers a fast, effective, and less invasive approach to concrete leveling with PolyLevel®. The PolyLevel® system involves injecting an expanding polymer foam under the concrete for a durable, long-lasting solution. If you're interested in learning about what PolyLevel® can do for you, call us for a free estimate in Grand Rapids, Lansing, Kalamazoo and nearby. More importantly, this kind of solution is temporary. Even with the voids filled, the soil below is likely to continue settling over time. Ultimately, you'd have to call your contractor to your home over and over again to repeat the mud jacking process -- or call someone who can use a different solution that can fix it once and for all! Ayers Basement Systems is Mid, Western and Northern Michigan's trusted concrete leveling contractor. 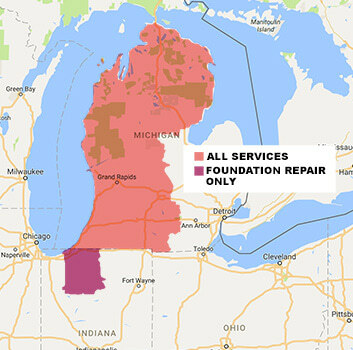 Schedule an estimate in Muskegon, Battle Creek, Mount Pleasant, Jackson, Niles, Alpena, Traverse City and nearby to learn more about why PolyLevel® is our top choice for repairing sunken driveways, sidewalks and more!